MK9 Holder for your belt. Adding a belt holder for your MK9 or Fox Labs gun Handle pounder Chemical Sprays is a snap with this heavy duty web nylon holder. Designed for either right or left hand draw with ambidextrous thumb snap. 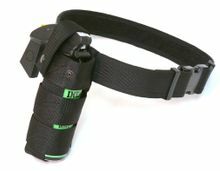 Fits on your duty or utility belt as snugly as you want. Cross-stitched joints and heavy duty black snaps. Adjustable ride. This is just the holder, you have to have your own belt and pepper spray.